Bandwidth (also called data transfer) refers to the amount of data that passes to and from your website. An oversimplification is bandwidth is a reflection of how much traffic your site is driven. Hosting plans with unlimited bandwidth don’t place a monthly cap on that amount of data – but you may run into throttling if too many people visit your site. The following hosting plans all have unlimited bandwidth. Unlimited bandwidth truly is unlimited in a certain metric – bandwidth can have a dual meaning, referring to the amount of data that can pass to and from your site in a given month as well as the speed of data transfer. While unlimited bandwidth won’t net you a faster transfer speed, it does mean that a web host won’t cut your site off after it exhausts its available resources. Unlimited bandwidth is also called unmetered bandwidth. Both terms refer to the same type of plans, but some experts do make a distinction. Unmetered is often used because it is a more accurate description and sets expectations better. Throttling occurs when you pass a certain threshold of data transfer in a given month. Similar to how cell phones will kick you down to a slower network if you have used too much data on your phone, throttling slows down the data transfer speeds for your site, increasing the time it takes for your website to load. While the speed is reduced, the amount data that can transfer remains uncapped. Throttling can be avoided by staying under your monthly threshold. Bandwidth caps and thresholds are typically measured in megabytes (MB), gigabytes (GB), or terabytes (TB). On the other hand, transfer speed is measured in bits per second or bps with Mbps referring to megabits per second. How much bandwidth you need can be determined fairly accurately with an in-depth process, but at a basic level, the amount of bandwidth you need is dependent on how many people visit your site and how much content it has. For most small businesses serving a limited area, bandwidth is rarely an issue you have to worry about. People want to be able to have their desired content on their website without worrying about a low bandwidth. Below is a simple three-step formula to calculate your estimated bandwidth. Once you know how much bandwidth your website needs, you can make better decision in finding the right web host. Find out how big your average page is in KB (kilobytes). For example, let’s say the average size of each page on your website is about 210KB. Multiply this by your average number of visitors per month. If you have 15,000 monthly visitors, then you get about 3.15GB. Multiple this by the number of pages viewed by each person. If each person views about 10 pages, then you’ll need about 32GB of bandwidth at a minimum. NOTE: If you allow visitors to download files, you’ll also need to know the average number of downloads per day and the average file size and factor that in. If you’re launching a new website, it’s a little difficult to determine how much bandwidth you’ll need. Your best bet is to monitor your site’s traffic for the first few months and then determine monthly usage. Even with an unlimited bandwidth hosting plan, it is still possible to experience bandwidth issues on your site. The most obvious solution is to upgrade your web hosting plan. You may want to consider upgrading to a VPS, Cloud, or Dedicated hosting plan if you already have an unlimited hosting plan on a Shared server. HTTP Requests: Remember that bandwidth is like a tunnel that data passes through. If you can’t make the tunnel bigger by upgrading your plan, then make the data “smaller.” One way you can reduce your HTTP requests is by combining all of your CSS into one style sheets page. Compress Images: Sites with a lot of high-quality images will likely experience slower load times, since those files are larger than low-quality images. Compressing your images allows you to keep quality content on your site and have the files take up less space on your server, which increase your loading speeds. There’s a lot of information about unlimited bandwidth and how to choose the right hosting plan based on your site’s needs. We’ve sorted through many of these resources to help you find accurate and reliable information so you’re not left with buyer’s remorse. 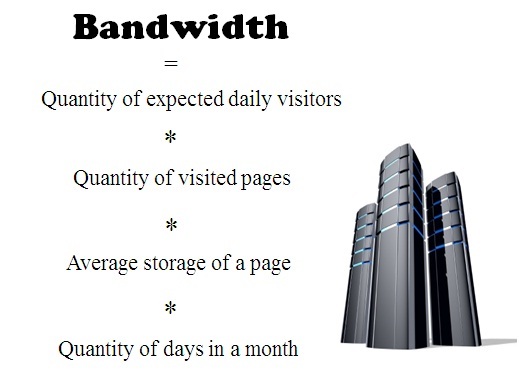 What is Bandwidth in Web Hosting? (video) – From the author of Web Hosting For Dummies, this video provides a quick and basic understanding of what bandwidth is, and how to calculate it. The Real Meaning of “Unlimited” in Web Hosting – While this article is overtly opinionated, it also brings up several good points to consider before choosing an unlimited bandwidth web hosting plan. Data Never Sleeps (infographic) – If you’re still wondering why increased and unlimited bandwidth plans are becoming so popular, just take a look at this infographic that breaks down the amount of data that is used every minute by some of the biggest websites. Remember that more bandwidth allows for more and bigger data to transfer at a faster rate. Bandwidth and Data Transfer – Web hosting companies sometimes use “bandwidth” and “data transfer” synonymously, and this site aims to bust that practice. Here you’ll learn the differences between the two and how they each affect your website. 10 Ways to Speed Up Your Website – and Improve Conversion by 7% – Amazon, WalMart, Radware, and Akamai all conducted separate studies showing that slower load times lead to loss of revenue. Apply these 10 tips to prevent this from happening to your website. PageSpeed Insights – The is a free tool from Google Developers that will analyze your site’s performance on both mobile and standard platforms, and offer suggestions on ways you can improve. Web Developer’s Guide: How to Speed Up Your Website – This is a two-fold article that will not only help you improve your bandwidth, but improve your site’s SEO as well. 10 Free Tools for Monitoring Network Bandwidth – The first step to improving your bandwidth is to figure out what the issue is. Here you’ll find 10 tool that will observe and analyze your site’s bandwidth. Pingdom Website Speed Test – Similar to PageSpeed Insights, this free tool allows you to see areas of your site that are both enhancing and detracting from your website’s load times.